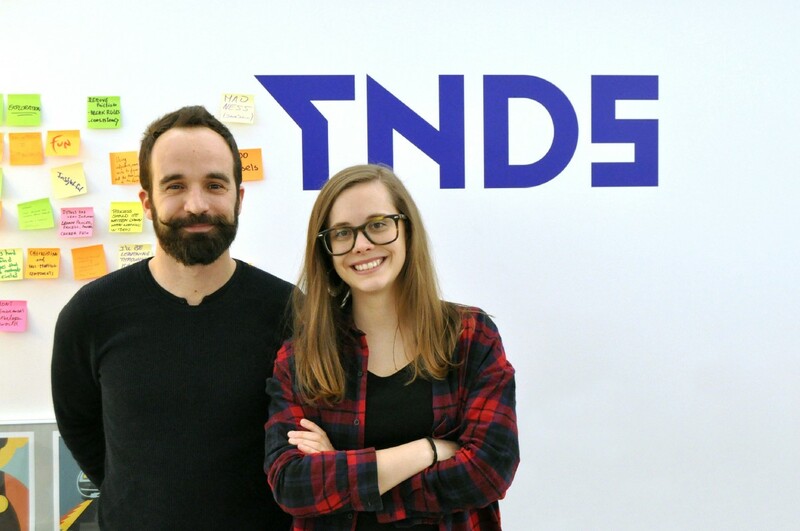 Everything we do at TNDS is done with a single purpose: to achieve the Student-Market Fit. A match between the designer’s hard and soft skills and the kind of profile companies need and are really looking for. Two of Bitmaker‘s founders in the center, with the assigned TNDS team of 3 students and 1 facilitator in June 2018. At TNDS partnerships are important and very valuable for both us and our selected partners and at the root of our model: The Student-Market Fit. Read more about it by visiting http://tnds.school/success_model. We could just train the students how we would assume they should be trained and then leave the scene. But there are two main reasons why we have to get involved with great startups, tech companies, studios and design agencies. One is shaping TNDS program outside-in: A school is supposed to prepare its students for the future. However, no one has the ability to predict it. So rather than making speculative anticipations of the weather outside, at TNDS we prefer to get our feet wet and work directly with the companies who are going to recruit the next generation of designers. Another is shaping industry inside-out: quality education must impact not just the students, their skills and attitudes but also the industry itself. Our students are being prepared to deal with a number of common scenarios that are important to handle in digital-driven companies. They will certainly bring new processes and higher efficiency into the way these companies operate after being exposed to the pool of the talented international mentors of the TNDS program. R&D and innovation is something your company needs but you don’t have the team or the means to do it. There’s a specific feature or user story in your product that needs to be optimized and tested and you would like fresh eyes on it. You’re looking for new talent to hire and your company has had a bad time finding the right candidates in the past. You’re looking to hire and want to save time in training and onboarding those people. Besides bringing cutting-edge methodologies and approaches to problem-solving to your company, by being in this partnership, you are also supporting the wider design and innovation community, by allowing us to run more public events and, of course, continue preparing new, well trained, problem-solving designers not only for your company but for the industry. Have access to our recruitment program (more on that below). Have access to projects with the current TNDS team (plus 20% discount on fees of a 2nd project). Support TNDS students with learning experiences like doing a corporate/personal presentation, one-to-one mentorship, organizing an event or other valuable ways of sharing experience/knowledge. Run a TNDS workshop and share your knowledge with our students. Sponsor (or host) a public TNDS event, like a workshop with one of our awesome guests or a new meetup concept that we might help you with. Both your team and the community will love it! Free access to exclusive TNDS events and workshops with awesome guests like Vitaly Friedman. Throughout the year we have specific slots for Training (Masterclasses & Workshops), Mentoring, Projects and Recruiting activities. As a partner you’ll be involved in several of these, so here’s a yearly overview of the stage for each one. An overall timeline of events throughout a TNDS year. Our recruitment program is unlike traditional recruiting agencies. It’s designed to act as a launch ramp for the new designers to gradually enter the companies with the support of the TNDS team, so that both candidate and hosting company want to work together. A breakdown of the steps in the TNDS recruiting program. Let’s hack Digital Design education together! Thanks to Sara Noronha Ramos and Daniel T Santos. UX Designer and founder of @newdigitschool. Often considering dessert before dinner.